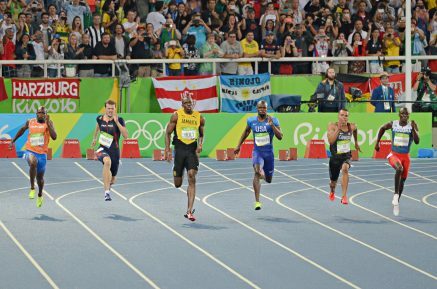 21st August 2016 – If there were any lingering doubts left about his legendary status Usain Bolt (JAM) dispelled them with yet another dominant display of sprinting at the Olympic Games in Rio de Janeiro. Usain completed an unprecedented ‘triple triple’ by retaining the 100m and 200m titles that he had already won in Beijing and London, before then anchoring the Jamaican 4x100m quartet to their third straight Olympic title. In his usual flamboyant and entertaining style Usain finished first in all six of his individual races which culminated with victories in 9.81 seconds in the 100m and 19.79 seconds in the 200m before finally combining with his Jamaican teammates to clock 37.27 seconds in the relay. Kemar Bailey-Cole (JAM) will also receive a gold medal after he ran the last leg for the Jamaican team in the semi-final. Trayvon Bromell (USA) made his Olympic debut and finished eighth in the 100m final. He was also part of the American team that originally placed third in the 4x100m before they were unfortunately disqualified for an illegal changeover. Four years after being a kit carrier at the London Olympics, Dina Asher-Smith (GBR) was on the other side of the starting blocks this time around. Dina matched her fifth place finish from last year’s World Championships over 200m with another fifth place here, before running the third leg for the British team that claimed 4x100m bronze medals in a new British record of 41.77 seconds. Jenna Prandini (USA) just missed a place in the 200m final after placing fourth in the semi-final. Very rarely does a championships pass without Christine Ohuruogu (GBR) collecting a medal of some description and that was the case again here. After narrowly missing a place in the individual 400m final, Christine was handed the responsibility of anchoring the 4x400m team in both the semi-final and final. With her wealth of experience there can be no one better in these situations and she brought the team home in third place to pick up the bronze medals, the third Olympic medal of Christine’s glittering career. Ristananna Tracey enjoyed a real breakthrough as she took fifth place in the 400m hurdles. After cruising through both her heat and semi-final as an automatic qualifier, Rista was still able to run 54.14 seconds for a new PB. Another athlete setting a PB was Matthew Hudson-Smith (GBR) as he once again demonstrated his speed and strength over the final 100m. In his semi-final Matthew placed second in 44.48 seconds after entering the home straight in fifth, and then he was just narrowly outside this in the final clocking 44.61 seconds for eighth place in what was arguably the greatest 400m race ever as the world record was broken and three men ran under 44 seconds.